The princes who were not liking this hard life of the aashram were feeling unhappy and planned a prank to make the sage teacher angry. They hoped if the teacher will be unhappy, he will send them all back to the palace and they will again live the life comfortably. One of the prince who brought his rat with him, left it in the hut of the teacher in the dark night, with the hope that the rat will damage the books, the teacher have prepared with hard work. And that would be enough to make him unhappy with them. Though when they left the rat, the teacher was awakened. He saw it and smiled. On the next day when the princes expecting the outcome of his prank as their release from the ashram, found that the teacher was not unhappy and the rat hadn’t done any damage to his valuable books. When they have had a discussion about this with the teacher, and expressed their surprise that the rats haven’t done any damage. The teacher replied them with a story. It was the story of a sage named YagnaValkya and his daughter. Once upon a time in ancient India there was Sage YagnaValkya living in Jungle with his wife. Once when he was paying respect to the God from the river. He got a small femice mice landed into his open hands from the mouth of a flying bird. As the sage and his wife doesn’t have a child the sage transforms the mice into a girl. He then took the girl to his hut where he and his wife raise her with love and affection and educates her. The girl was named as Sukanya. The sage’s wife notice some strange habits in the girl while she is growing. She asked the same to the sage, who then replied her, that “its her nature”. Then later when the girl grown up fully, Yagnavalkya and his wife decided to get her married. They have started finding a good groom-to-be for Sukanya. On not finding the person having the needed qualities they decided to try out if any of the God and Sukanya find them compatible with each other. First he asked the Sun God. The God was ready but Sukanya found him to hot and bright to deal with. The Sun God then told that the Clouds are more powerful, which have capability to stop his rays coming onto the earth. When asking to the Rain God, Sukanya found him also incompatible to him. The Rain God suggested to try with The Wind God who is even more powerful than himself. On meeting with The Wind God, Sukanya declared she don’t want to marry someone whom she cannot see. Then the Mountain God came to the way, who have capacity to stop the blowing winds. Sukanya found him too stubborn and hard to live with. The Mountain God told there is someone who is having capacity to hollow him from within and thats why more powerful then him. Later Sukanya found him compatible with her and decided to marry him. I am not declaring with whom Sukanya decided to got married. You can either guess or watch the episode for the same. It will be a joy to know the answer and even better is knowing the moral of the story. Which I guess better you explore on your own. 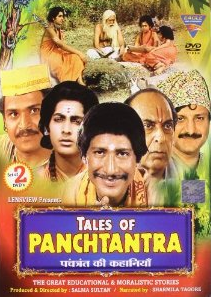 The story is obviously good, Parikshit Sahni is as natural as he is always, when playing the part of the sage Yagnavalkya. The acting of the actors playing Sukanya and her mother are okey. The teacher have played his roll well, and so does the princes. The locations are good. The background music is compatible. The dialogs are well written. The quality of the DVD video is not what you love to enjoy these days. There were not much special effects needed, but those executed are good. You will surely have to give it a chance, the message explored is really nice to go with.